The Highland Recreation Center in Largo was the site of the joyous annual gathering of some 600 people on December 4, when Isaiah’s Inn held its annual Christmas party and banquet. Ham and turkey with all the trimmings were enjoyed by all, and each child received a wrapped gift. Isaiah’s Inn is a Christian organization helping families, regardless of faith, who are committed to working or attending school while struggling to get back on their feet. It was founded more than 20 years ago by local CPA Bob Crown. The banquet serves families currently receiving assistance as well as those the organization has helped in the past. Pastor Randy Evans and his congregation at Grace Christian Fellowship assisted by the Thursday Morning Men’s Bible Study provide the food, music, entertainment, gifts and fun activities for the kids including making gingerbread houses, as well as the required setup and clean-up. Attorney Jim Dodson, who is a longtime member of Isaiah’s Inn’s board of directors, looks forward to the Christmas bash all year. He volunteers at the banquet, and along with other members of his men’s Bible study group, helps with setup, cooking, and serving. 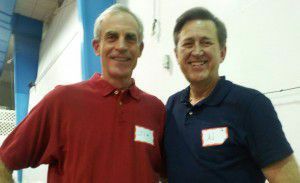 Jim is pictured here with well known Bay News 9 Senior Anchor Al Ruechel. Al is musical director at Grace Christian Fellowship and emcee of the annual banquet and like Jim, Al is deeply committed to involvement in the community.